The second line parade is a unique New Orleans tradition, and is a fantastic way to conclude a wedding reception or, as in this instance, for the couple and their guests to make their way to the reception venue after the ceremony. Traditionally, the "second line" would consist of random people who would tag along at the end of parade, behind the actual members of the parading organization, but in modern usage the term is more broadly applied and includes celebratory parades such as those for weddings. 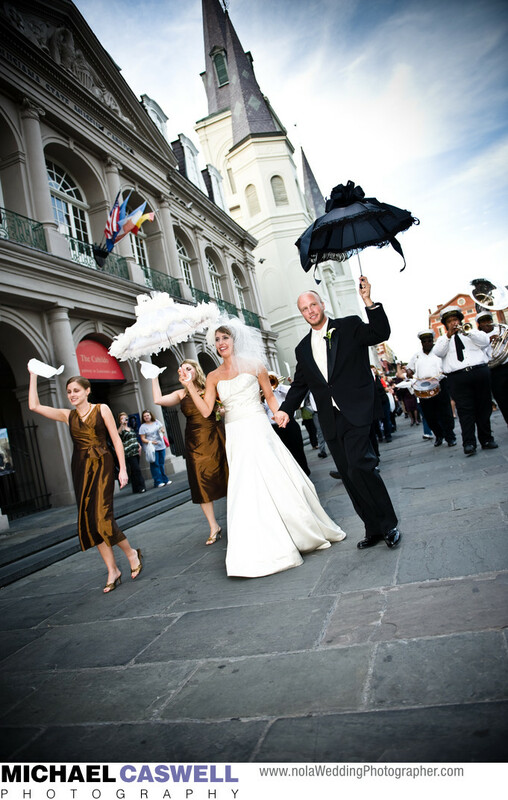 This parade began immediately following the couple's ceremony at St. Louis Cathedral, proceeding through the French Quarter to Latrobe's on Royal for the reception.